Departure from Lorien, Pt. 2: On the Anduin. The caps below follow immediately from the ones in the previous post, in which the Fellowship has just left Lórien. 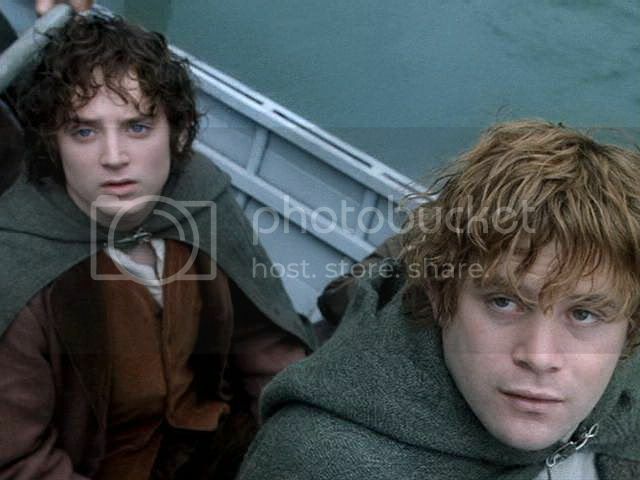 In the next five caps, the Fellowship is further down the river. The look of the caps is shadier, and Frodo has developed a blemish (more on that below). The light is a bit brighter in the 10 caps that follow, which come from the scene in which they approach and pass the Argonath. In the final caps, showing the travellers pulling up to the shores of Parth Galen, the lighting has changed again. In the middle group, Frodo sports what was affectionately called “The One Pimple", back on the second messageboard I ever posted at, Khazad-dûm (now defunct). 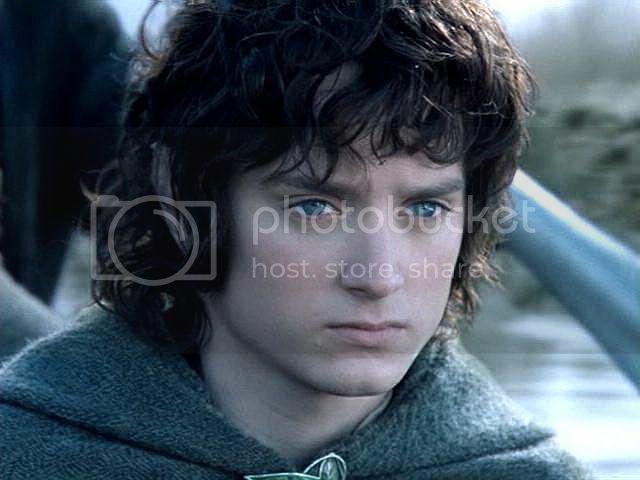 It’s funny, but until I became a film-Frodo fan, I never noticed the thing. I just didn't focus on him enough to see it. The blemish is more noticeable, however, in the excellent EE scene on the river at night. 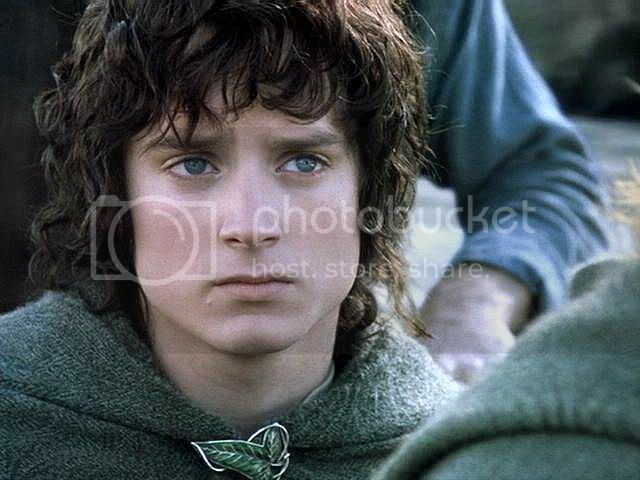 * In it, Frodo has a conversation with Sam that underscores Frodo's anxiety and anguish over having soon to make his decision. The scene also includes the spotting of Gollum and an argument between Aragorn and Boromir about the road they should take. Although I did not cap the EE scene on the Anduin, Blossom has done so. 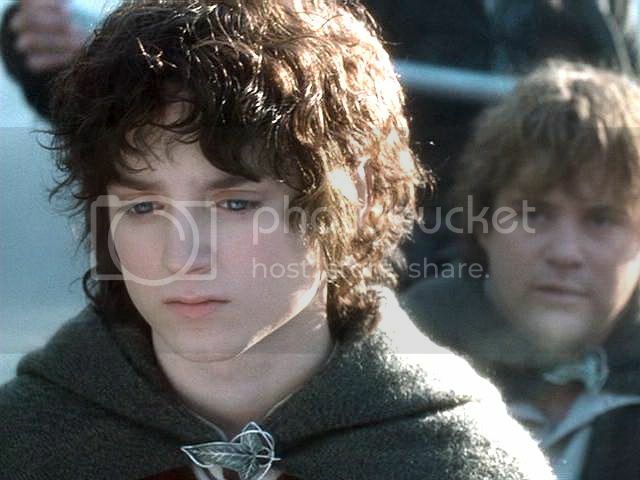 She has an excellent short slideshow of the scene on her Frodo website, In Dreams, as well as a great gallery of supplementary caps. Just go to “slideshows”, then choose, “You Can’t Help Me, Sam”. 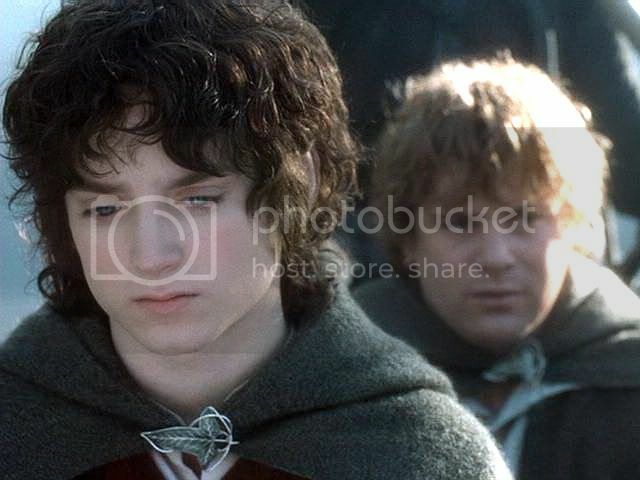 *Notably, the blemish disappears in the frames of Frodo overhearing Boromir and Aragorn's argument. Like the earlier scenes on the river, his reaction shot must have been filmed at a different time. But that makes sense, since this reaction shot originally was planned to fit somewhere else. 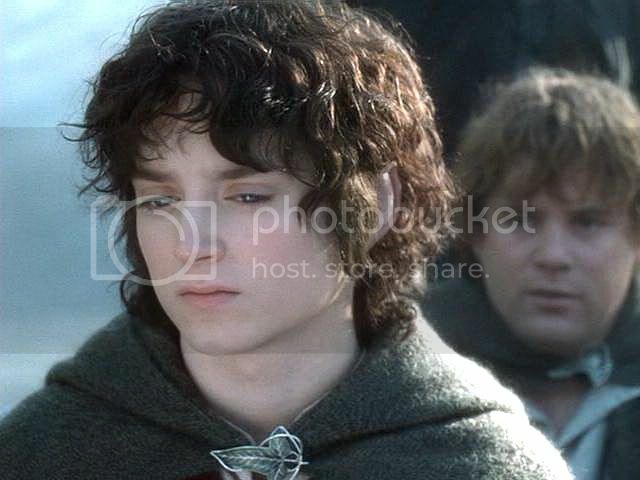 In the trailer for TTT, it was used to show Frodo listening to Gollum as he makes his first appearance in the film, crawling down the wall in the Emyn Muil. 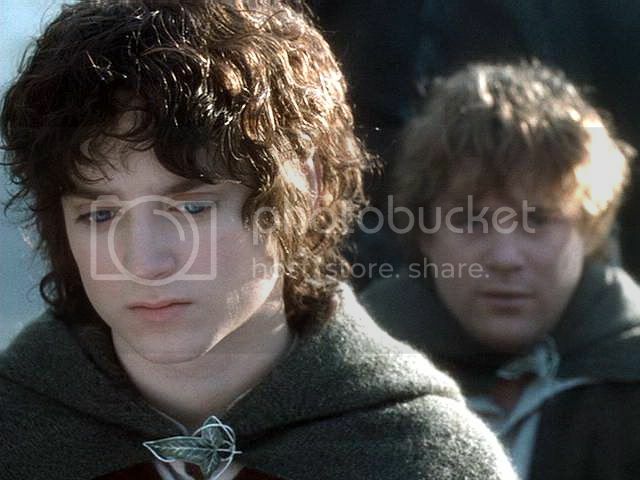 After the close-up of Frodo thinking, the camera follows the Fellowship from above as the Anduin carries them along. Shots of the Orcs pursuing are intercut. Aragorn, Boromir and Legolas, as if intuiting their proximity, respond with looks of alarm and watchfulness. As the river curves through a narrow gorge, the river slows. 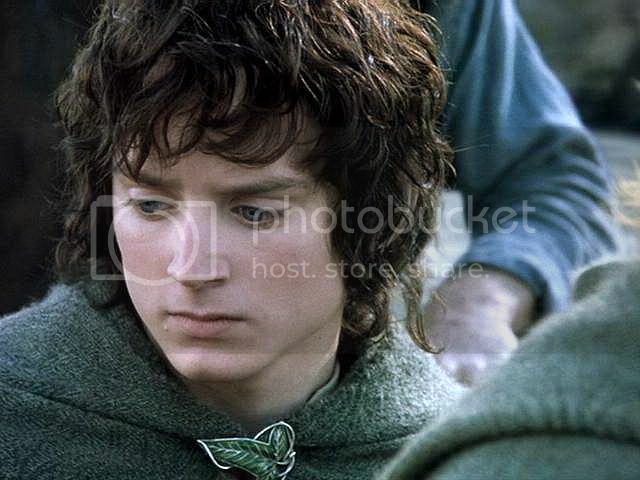 Frodo is lost in thought when Aragorn taps him on the shoulder. 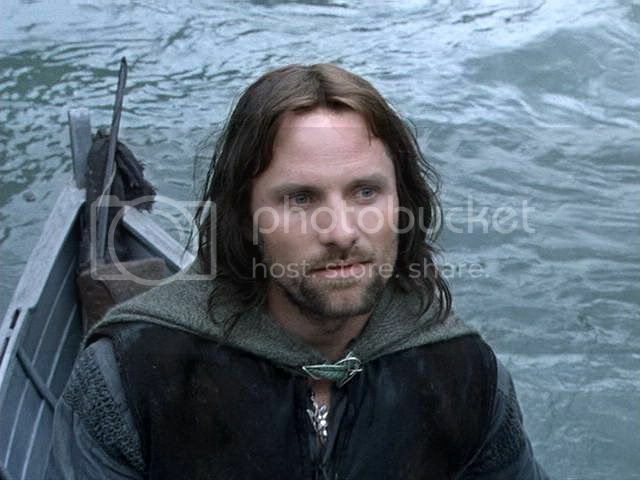 Aragorn: Frodo, the Argonath! Long have I desired to look upon the kings of old. My kin. 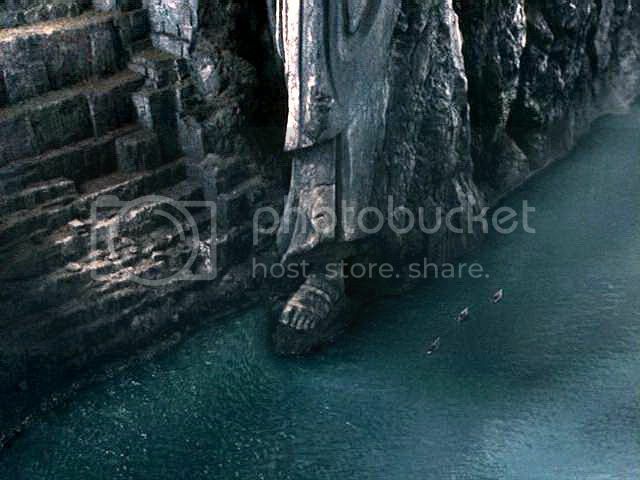 Frodo and the other members of the Fellowship look up in awe and wonder at the two monumental statues carved out of the rock face, proudly standing on either side of the narrow gorge, their hands raised in gestures of warning. Gliding by the statue’s sandaled foot their boats look dwarfed. After the narrows, the river empties into a lake, Nan Hithoel, surrounded by mountains. In the distance is the spike of Tol Brandir and the smoking falls of Rauros. At Parth Galen they pull their boats onto the gravelly beach. 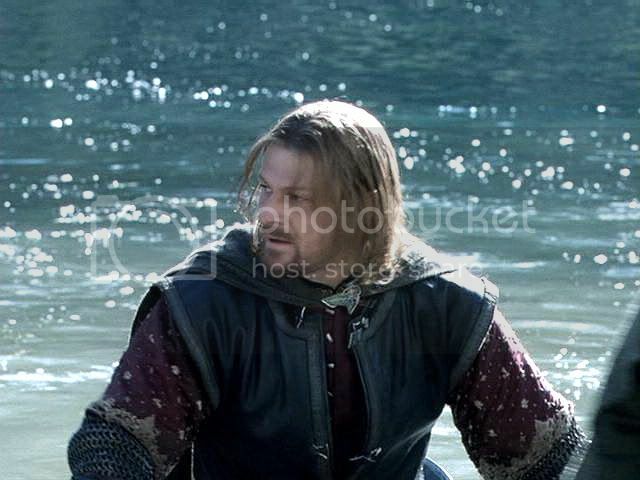 Boromir appears to be fighting a conflict within him and Frodo looks disturbed and anxious. 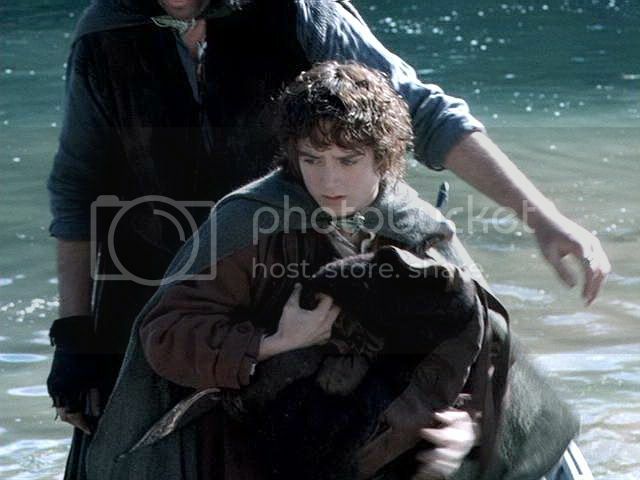 The Fellowship starts to make camp. The screencaps below were all made from the theatrical version. Only the theatrical version comes in the fullscreen format, which is larger from top to bottom, even if it cuts off the sides, making for better close-ups. 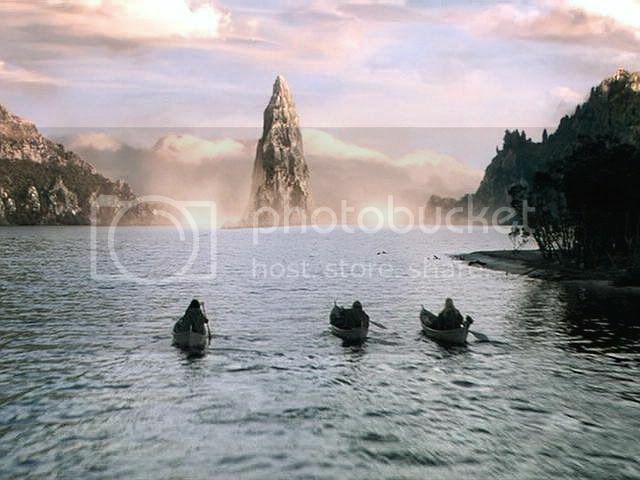 ~ Departure from Lórien Pt. 1: Galadriel’s gift. I just love Aragorn's gentle hand on Frodo's shoulder, and the soft reverence in his voice. What a special moment for both of them, entering Gondor and... all that lies beyond these guardians of stone. 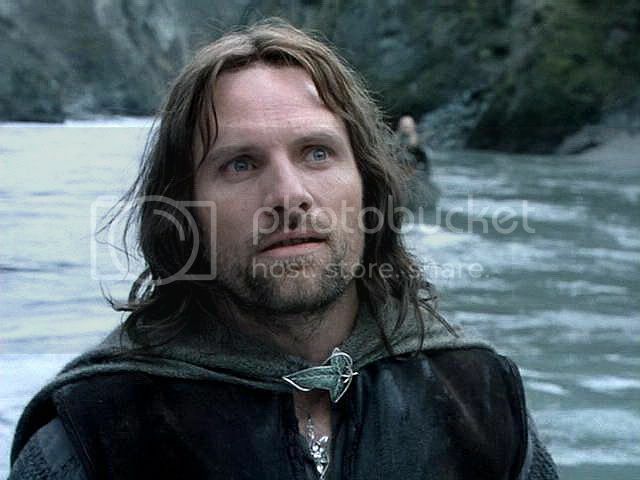 Oh, yes, Viggo does great things in this moment; he really *is* Aragorn in this moment, and his reverence, I think, carries the scene. 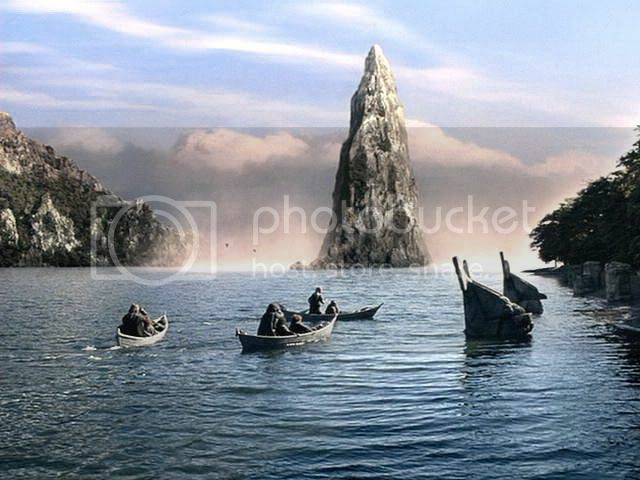 But all the others support what he does beautifully, as they look up and respond, each in his own way, to the Argonath. Thank you for this comment, Mews. Sometimes I wonder if screencapping is an utter waste of time, except for the zen of it (very tranquilizing and involving at the same time). But it really is a different way to appreciate the films and the story they tell. Oh, your screencaps are NEVER a waste of time! They're an absolute delight, always. I know how much time screencapping consumes, Mechitld, but in your case it is very much worth it. Your screencap entries are a joy to treasure, to return to again and again, along with your commentaries ~ always so observant, often picking up on small details and nuances that make me look at a particular scene or character from a different perspective. 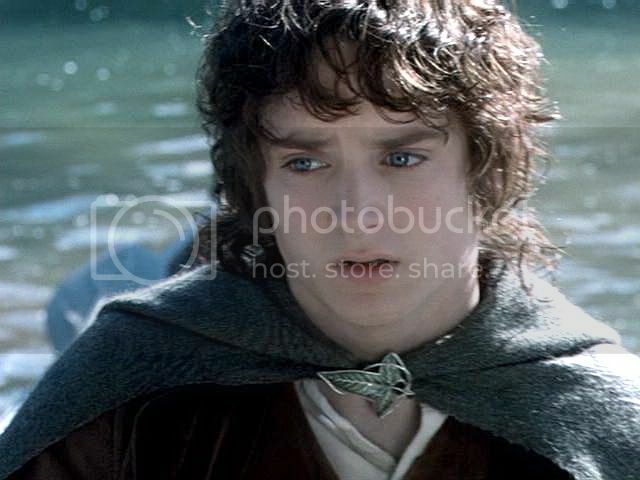 Your screencaps and writing certainly enrich my own appreciation and understanding of the story and our beloved hobbit. Thank you. 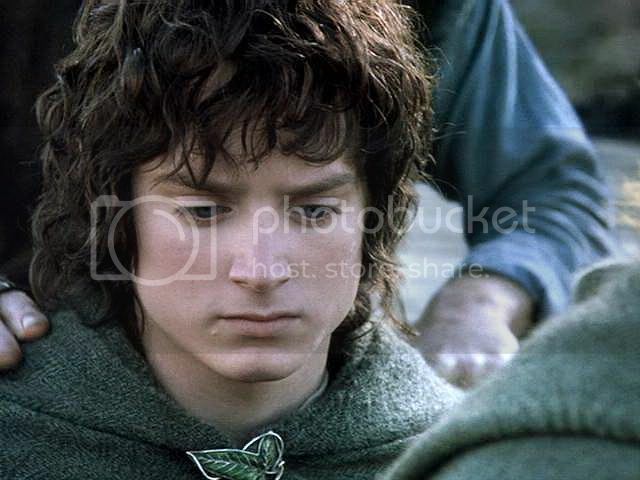 I love the moment of tension between Boromir and Frodo here ~ perfectly portrayed by both actors. Thank you, Blossom, O Screencap Maker Extraordinaire! 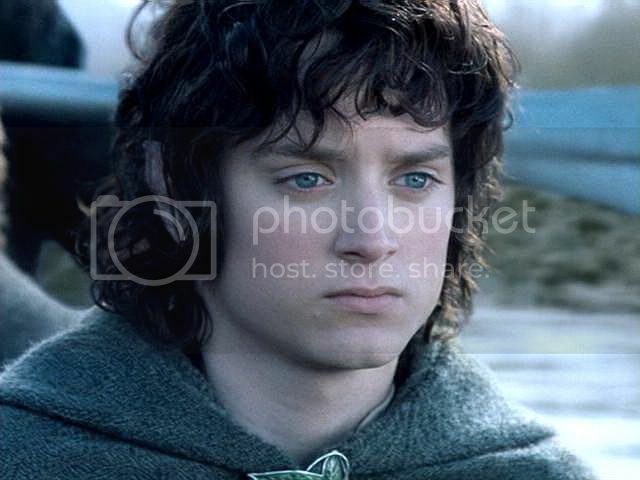 I do wish there was a fullscreen version of the EE, just to look for Frodo's close-ups. 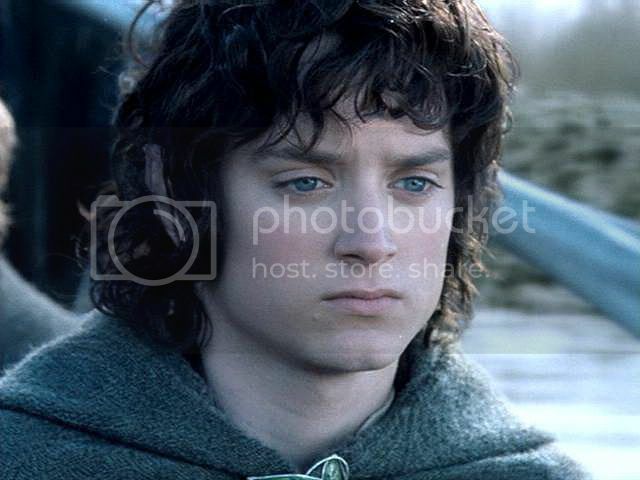 I just answered a regular email to you about Frodo in that EE scene. I so wish it had been included. It was indispensible for showing Frodo struggling mightily, if sorrowfully, to gather his courage to do what he knows must be done: make the break from the rest of the company and go off on his own. P.S. 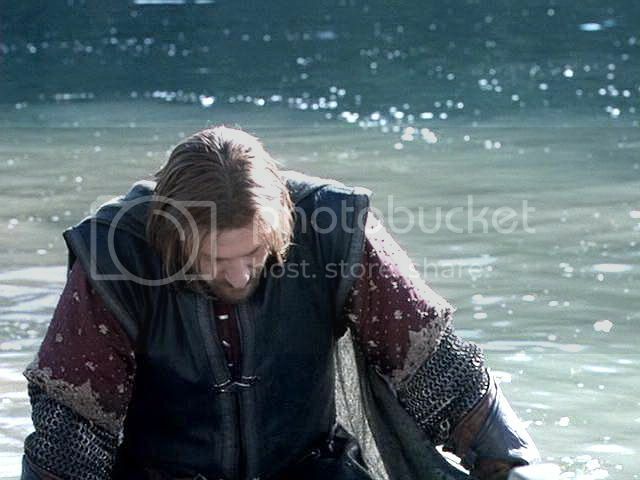 Meant to agree with you on the Boromir sequences. 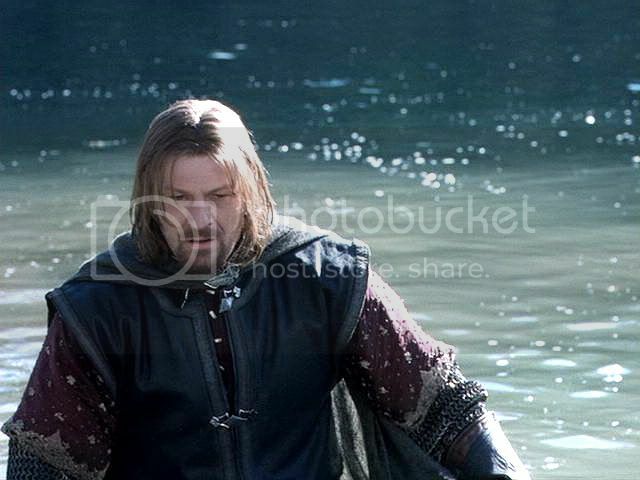 Well, I think Sean Bean was stupendous as Boromir, so I appreciate anything he does. But I think his little moment in the boat as they are pulling up onto Parth Galen, when he seems to be getting a shiver up his spine and shakes himself, is just brilliant. I love the Anduin scenes for the open landscape in contrast with the intensity of Frodo look. He comes out from Lothlórien changed and with a new awareness: the naive hobbit has disappeared and now he knows what is behind him. In distancing himself from the Fellowship his pose become deer-like fearful and alert. Elijah acting is great both with his look and with his body language. 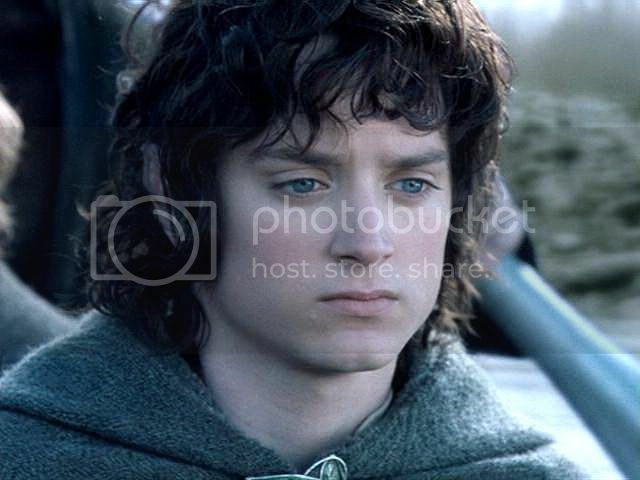 Frodo eyes are deep and remote as if he see the future events. Among all the beautiful Frodo images I think the Anduin ones are really breath taking. He comes out from Lothlórien changed and with a new awareness: the naive hobbit has disappeared and now he knows what is behind him. 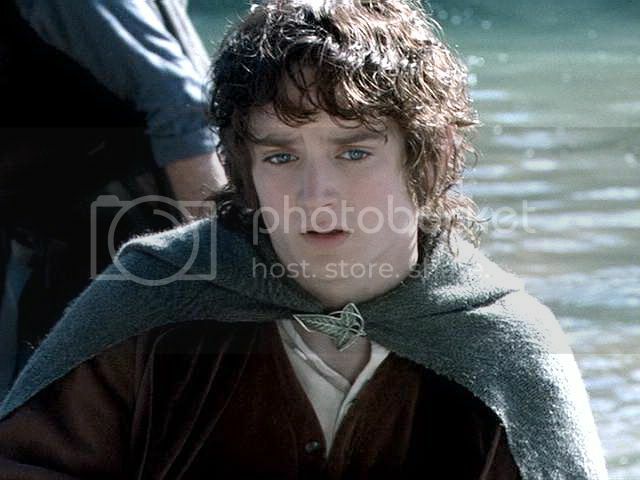 In distancing himself from the Fellowship his pose become deer-like fearful and alert. 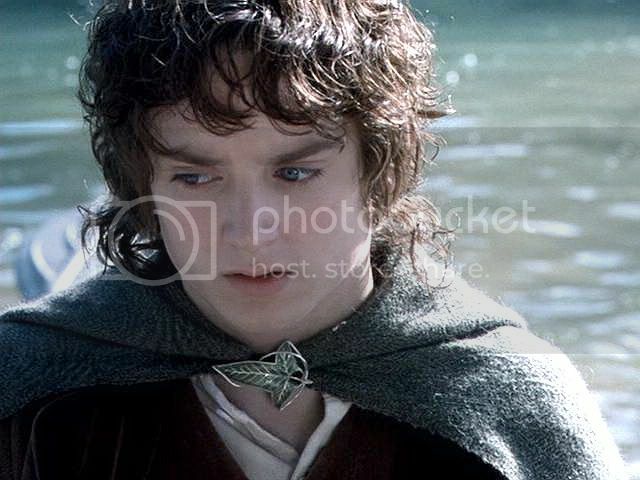 (...) Frodo eyes are deep and remote as if he see the future events. I especially loved these observations, Estelanui. Thanks for posting this comment! 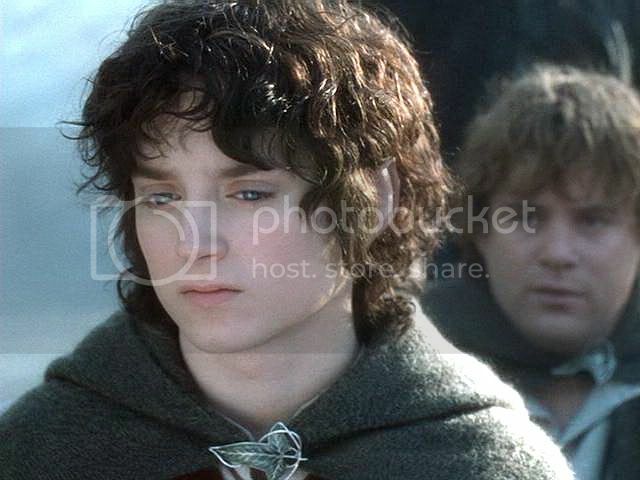 These lovely screencaps are a wonderful way to appreciate the subtleties of the changes in expression playing over Frodo's face. 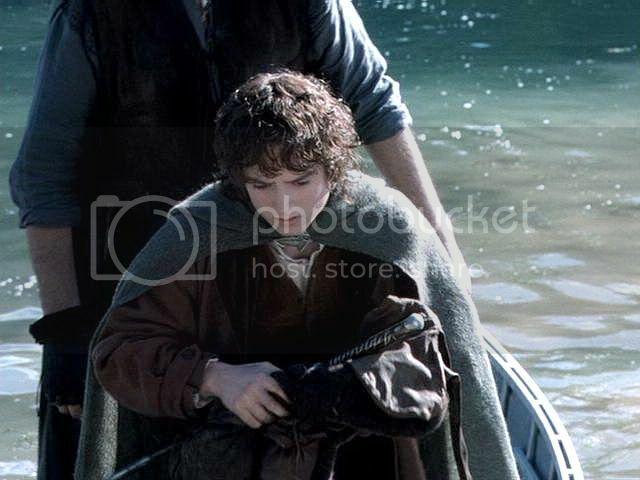 At the beginning of the voyage there is so much of withdrawn grief, as though still numbed from the loss of Gandalf. 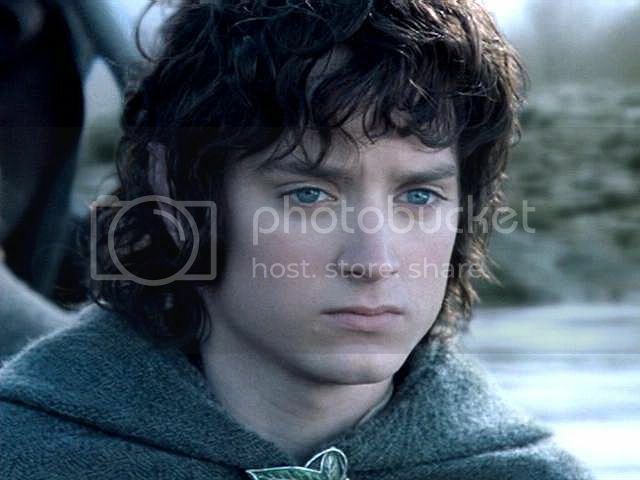 But later, perhaps as he ruminates Galadriel's words, the enormity of his task and the nearness of multiple threats including Gollum begin to show in both increased fear and growing inner determination. This really must be one of the hardest things for an actor to portray, all those complex thoughts and emotions playing 'behind the eyes'. I know Elijah is not a method actor but I can only imagine the kind of in-character internal dialogue that must be necessary to convey such shades of unvoiced feeling. Thank you, Mechtild. Always a joy. the enormity of his task and the nearness of multiple threats including Gollum begin to show in both increased fear and growing inner determination. Yes, yes, yes! Blossom noted that, too. 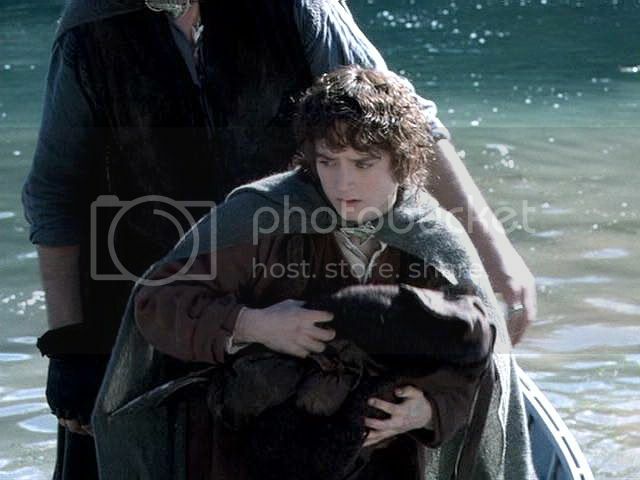 Like her, I wished the EE scene of Frodo resigning/working himself up to the inevitable, inside, in the "You can't help me Sam, not this time" scene, had been in the theatrical version. 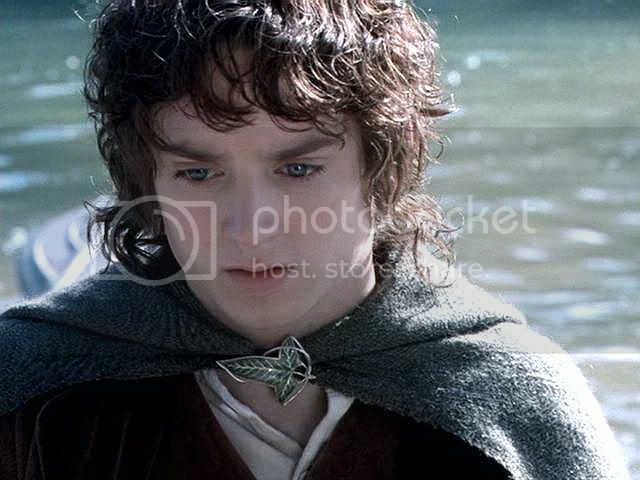 But, as your comment points out, a lot of that growing determination and sense of "I must, I will do it", still came through in the sequence of shots they chose of Frodo for the river scenes. The river sequence is understated, but it's just so good, for all the characters involved.